Hi, as I mentioned at my previous post my dear friend +Coco Bolinho brought me new products from Essence's New in town trend edition collection. I swatched and reviewed about its lipgloss here and now it's time to move on to this lovely collection's eyeshadows,eyeliner and nail polishes. Strawberry ice cream: is a pale shimmery pink with cool undertones. Disco Diva: is a metallic lilac with cool undertones. Pigmentasyonları orta karar, ama kalıcılıklarını beğendim. Far bazı uygulamadan kullandım 2-3 saat bir problem yaşamadım. They have average pigmentation. I used them without eyeshadow primer but they stayed for 2-3 hours. Love the eyeshadow colors. Really pretty. 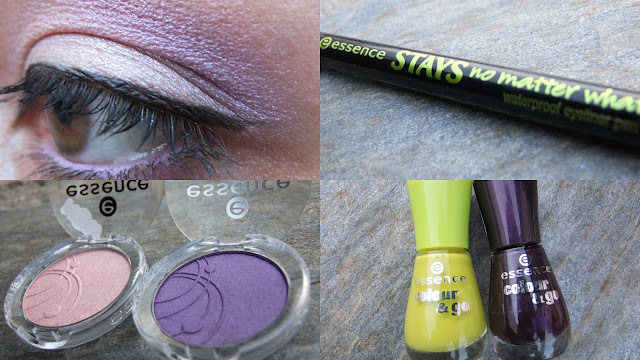 I like the violet eyeshadow. do you wanna follow each other? i follow you yet!